In this weeks reading from Parsahat Va’etchanan (Devarim / Deuteronomy 3:23-7:11), Moshe asks the Lord if he can to go into the Promised Land and the Lord tells him no. The Lord told him to go up to the top of Pisgah and see the Promised Land with his own eyes (look north, east, south, and west). Moshe then proceeds to urge Israel to obey God’s instructions for life (the Torah). He says to keep your soul diligently and to not forget the things the Lord has done so that the testimony (the Torah) does not depart from your heart all the days of your life. He goes on to say they should teach God’s word to their sons and grandsons, so they too learn to fear the Lord all of the days they live on this earth (4:9-10). The Ten Commandments are repeated and then we are told how Moshe interceded on behalf of the people at the mountain of Sinai. We are told to obey the Lord, His commands, His statutes, and His judgments so that the Lord will prosper you. Moshe warns the people who are entering the Promised Land to tear down the altars, smash the sacred pillars, cut down the Asherim, and burn the graven images with fire the people have set up in Canaan. God says that you are a holy people, the Lord God has chosen you to be a people for His own possession out of all peoples who are on the face of the earth (7:4-6). At the mountain of Sinai, the people feared God and asked that Moshe speak for them on their behalf. They were afraid to hear the voice of the living God speaking from the midst of the fire so they asked Moshe to draw near, to hear the word of the Lord, and then bring that word back and they will do what God has commanded (Devarim / Deuteronomy 5:27-29). Duties of the heart alone (the subject of his book). Duties of the body and heart together. These involve prayer, Torah study, praising and glorifying God, teaching wisdom, enjoining right conduct, warning against evil, and the like. Duties of the limbs, in which the heart has no part except for initially directing the act towards God. For example, sukkah, lulav, tzitzis, mezuzah, observing the Shabbat, the festivals, and giving charity, to name a few. 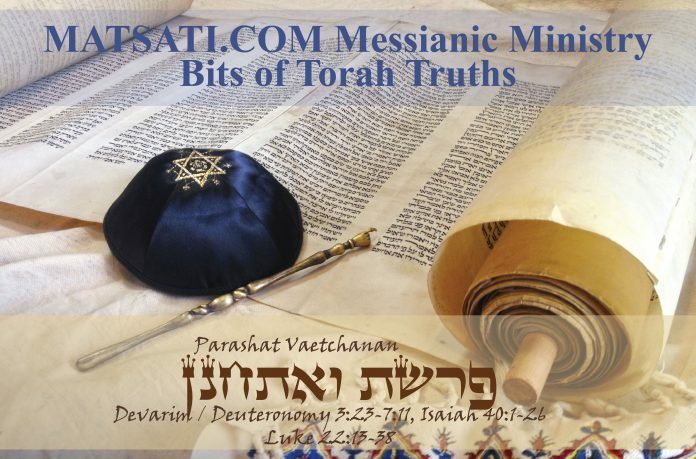 The topic of prayer and the One whom we draw near to based upon the Torah portion has led to many written works in Jewish thought and practice. The importance of prayer, drawing near to the Lord, knowing whom it is we are standing before, should permiate every area of our daily lives. Because of the magnitude of God’s words in Parashat Va’etchanan, that what the people were asking for was good and their fear of the Lord, the rabbis pick up on this in Midrash Devarim Rabbah on drawing near to the Lord. Let’s read what they have to say regarding this topic. “… Rabbi Judah son of rabbi Simon said, You will find that idols are near and yet distant, and the Holy One blessed be He, is distant and yet near. How are idols near? A heathen makes an idol and places it within his house, then that idol is near unto him. And whence do we know that this very idol is distant? For it is said, Yea, thou one cry unto him, he cannot answer, nor save him, etc. (Isaiah 46:7); thus the idol is distant. And God is distant and yet near. How? Rabbi Judah son of Simon said, From here the earth unto heaven is a journey of five hundred years; hence He is distant. Whence do we know that He is also near? A man stands at prayer and meditates in his heart and God is near unto his prayer, as it said, O You that hears prayer, unto You does all flesh come (Tehillim / Psalms 65:3). David said before God, Master of the universe, when the nations of the world come to pray before You do not answer them, for they do not approach You with a perfect heart, but they first appeal to their idol, and when it does not answer them and they see their sore plight they approach You; then do You also not answer them, as it says, They cried, but there was none to save; even unto the Lord, but He answered them not (Tehillim / Psalms 18:42). What is the meaning of, They cried? They cried to their idol. And when they then approached You, Unto the Lord, but He answered them not. But when Israel call unto You, You hear our prayer immediately, as it is said, Answer me when I call (Tehillim / Psalms 4:2). God said to him (David), You say, Answer me when I call; by your life, even before you call will I answer you, as it is said, Before they call, I will answer (Isaiah 65:24); for I have no other nation but you. Whence do you know this? From what we read in the same context, For what great nation is there that has God so near unto them, ans the Lord our God is whensoever we call upon Him? Another explanation, AS THE LORD OUR GOD. This bears out what Scripture says, But as for me, let my prayer be unto You, in an acceptable time (Tehillim / Psalms 69:14). Rabbi Khanina son of Papa asked rabbi Samuel son of Nakhman, What is the meaning of the verse, But as for me, let my prayer be unto You in an acceptable time? He replied, The gates of prayer are sometimes open and sometimes closed, but the gates of repentance always remain open. He then asked him, When do you know this? Rabbi Samuel replied, Because it is written, With wondrous works do You answer us in righteousness, O God our salvation; You the confidence of all the ends of the earth, and of the far distant seas (Tehillim / Psalms 65:6). Just as the ritual bath is sometimes open and sometimes closed, so too the gates of prayer sometimes open and sometimes closed; but as the sea ever remains open, so is the hand of God ever open to receive the penitent. Rabbi Anan said, The gates of prayer also are never closed, for it is written, As the Lord our God is whenever we call upon Him; and calling is nothing else but prayer, as Scripture in another context has it, And it will come to pass that, before they call I will answer (Isaiah 65:24). Rabbi Khiyya the elder said, It is written, Waite for the Lord; be strong, and let your heart take courage; yea, wait you for the Lord (Tehillim / Psalms 27:14); pray and pray again, and you may light upon the hour when your prayer will be answered. Another explanation, But as for me, let my prayer, etc. David, because he prayed as an individual, said In an acceptable time; but the prayer of a community never remains unanswered. This is the force of the expression As the Lord our God is whenever we call upon Him. In Midrash Rabbah Devarim, Parashat 2, Part 10, a discussion proceeds on idols, drawing near and yet being far away whereas the Lord God Almighty is far away but yet is near. The question is asked about the idol being near; the heathen makes an idol and places it within his house and the idol is near, it is also distant because the heathen pray to the idol and it does not answer. The Lord God on the other hand is distant but yet near because the man who prays the Lord is near to him. The idea is that when one prays one is standing in the very presence of God. The nations do not hear from God because they do not approach the Lord with a perfect heart (or in the way or manner in which God has designed). In Midrash Rabbah Devarim, Parashat 2, Part 2, the midrash speaks of the gates of prayer being open or closed whereas the gates of repentance are always open. A parallel is drawn to the mikvah (the ritual bath) being open and closed to the gates of prayer being opened and closed. The ritual bath, which is understood to be synonymous with repentance, is always open because the sea can be used as a valid mikvah to receive the penitent. Rabbi Anan disagrees with the previous conclusions and states the gates of prayer are always open because the Lord God is at every place that we call upon His name in prayer, drawing the conclusion that when one prays he/she is standing in the presence of God. The obvious conclusion based upon the midrash is that the drawing near to speak to the Lord is possible only for the penitent, the humble, the innocent, and for those who seek the Lord with a pure heart. Previous articleTehillim / Psalms 46, Part 2, Under what Condition is God our Refuge and Strength?